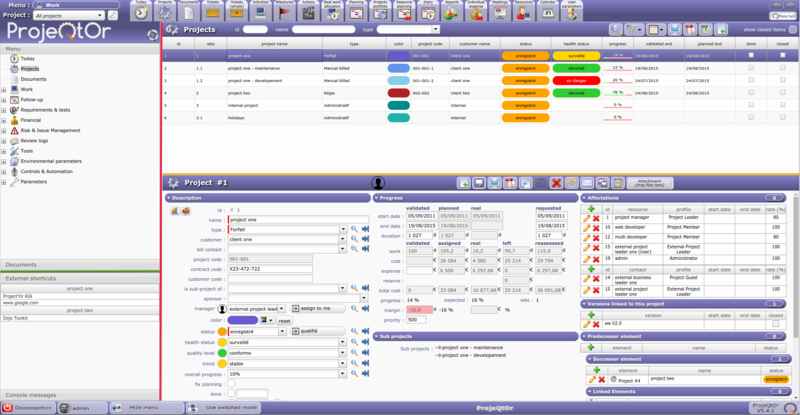 ProjeQtOr interface is divided into several areas. The splitters allow resizing areas in the interface. 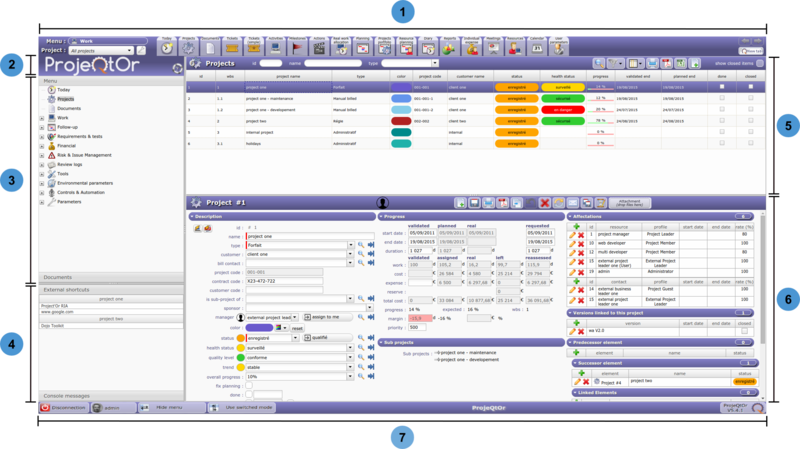 The green splitter allows to resize the areas «Menu and Documents window» and «Message and Link window». The red splitter allows to resize the areas left and right. The orange splitter allows to resize the areas «List window» and «Detail window». The position of splitters is saved and retrieved on each connection. Allows to select the project to work on. Restricted the visibility of all objects of the selected project, including sub-projects if any. Defined the “default” project for new items. Defines the project that will be selected by default. Change the project list display mode. List of project and sub-project are displayed according to WBS structure. List of project and sub-project are displayed according to entered text. List of project and sub-project are displayed according to search criteria. 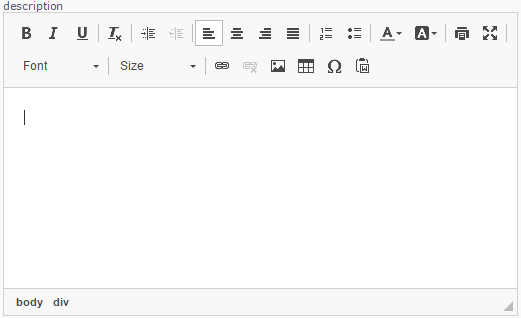 Menu on top bar allows a rapid access to elements. The menu selector allows to reduce buttons list displayed in the top bar. The arrows allow to scroll buttons list. Move cursor over the menu selector to display menus list. Click on menu to select it. 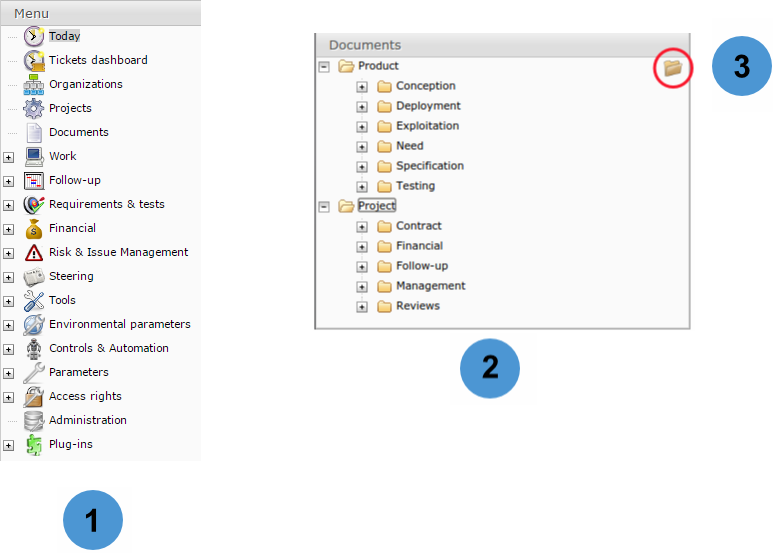 Predefined menus are available and regroup buttons according to the work context. A user can define its custom menu in the top bar. Move cursor over the menu selector and click on “Custom menu” to select it. Select a predefined menu (for example: “All menus”). Move the cursor over icon wanted. Click on the right button, a message appear. Click on the left button and the icon will be added to the custom menu. A star is added on selected icons. Move the cursor over icon (icon with star). Click on the left button and the icon will be removed from the custom menu. The navigation buttons give access to previous and next pages in the history. Allows to open a new tab within the same session. Click on «Logo Area» will display the software information box. Click on or use shortcut key F1 will open the online user manual, to the page corresponding to the current screen. You can change logo with your own. Refer to administration guide to replace the logo. To toggling between windows, just click on window header. The menu is proposed as a tree view of reachable items. The items presented will depend on the access rights of user to the screens. Click on a grouping line will expand-shrink the group. Click on an item will display the corresponding screen in the main area (right side of the screen). This parameter defines the size of icons in the menu. Document directories give direct access to documents contained in the directory. This icon gives direct access to the Document directories screen. Display hyperlinks to remote web pages. These links are defined as hyperlink attachments on projects. Links displayed here depend on the selected project. Displays information about main actions: insert, update, delete. The timestamp indicates when the action was done. Messages displayed here are not stored and will be flushed when user logout. Displays the element name and the count of items in the list. Each element is identified with a distinctive icon. Rapid filtering fields are proposed : «Id», «Name» and «Type». Search is considered as «contains», so typing «1» in «Id» will select «1», «10», «11», «21», «31» and so on. Will restrict the list to the corresponding type. Depending on the element, other filter fields will be available. Click on to get a printable version of the list. Click on to export it to PDF format. Click on to create a new item of the element. Click a column header to sort the list on that column (first ascending, then descending). If the sorted column is linked to a reference list with sort order value, the sorting is executed on this sort value. Sorting on the «Status» allows to sort values such as defined in the workflow. Click on a line (any column) will display the corresponding item in the detail window. The quick search allows to execute a textual search. Click on to close the quick search. The advanced filter allows to define clause to filter and sort. The advanced filter definition dialog box is divided into two sections. This section allows to define the filter and sort clauses. Define the clauses of filter or sort in «Add a filter or sort clause». Select the name of the field, the operator and the value to the clause. Click on to add additional criteria. Click on OK button to apply the filter. Click on Cancel button to revert to previous filter. To remove a criteria, click on on the line. To remove all criteria, click on on the header. Click on the Clear button to reset the active filter. Active filter can be saved to reuse. Fill the filter name and click on to save the filter definition. This section allows to manage saved filters. Click on a saved filter to retrieve its definition. Click on from a saved filter to delete it. Click on the Default button to define the active stored filter as the default, kept even after disconnection. The default filter is defined for the user. The filter will be automatically applied in the next connection. Defined filters can be shared with other users. Click on to share the selected filter. Click on to unshare the selected filter. Shared filters are available for all users in them session. The filter list allows to select a stored filter. To see the filter list, move the cursor over the advanced filter icon. Click on the filter name to apply. Click on «no filter clause» to reset the filter. This functionality allows to define columns displayed in the list for this element. Click on Reset button to reset the list to its default format. The columns display is defined for the user. The definition will be automatically applied in the next connection. Id and name are mandatory fields. They cannot be removed from display. Use the selector area to reorder fields with drag & drop feature. Use the spinner button to change the width of the field. Width is in % of the total list width. The minimum width is 1%. The maximum width is 50%. The width of the field is automatically adjusted so that the total list width is 100%. The width of the field cannot be less than 10%. The total width must be limited to a maximum 100%. The exceedance will be highlighted beside the buttons. 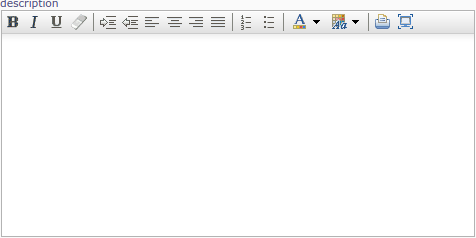 This may lead to strange display, over page width, on list, reports and PDF export, depending on the browser. 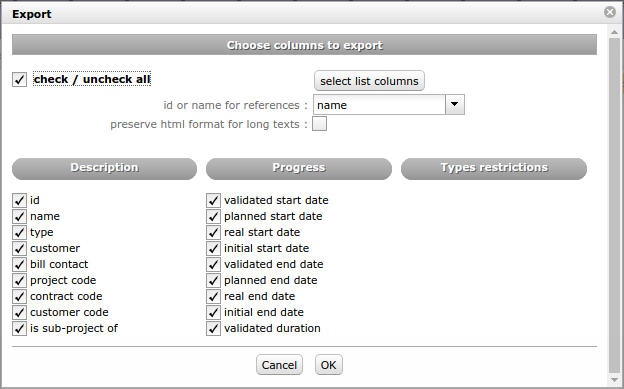 This functionality allows to export data of list in a CSV file. The fields are regrouped and presented in the order as they appear in the item description. Click on OK button to export data. Click on Cancel button to close the dialog box. The active filter defined will be applied to export data. The export definition is defined for each user. The same definition can be applied in the next export. Use the checkbox to select or unselect all fields. Click on «Select list columns» button to restrict selected fields to the ones that are currently displayed in the list. For fields that reference another item, you can select to export either the id or the clear name for the referenced item. Box checked indicating that HTML tags in a long text field will be kept during export. Identifies the item with the element type and the item id and name. Information on the item (issuer and creation date) in thumbnail format. Click on to create a new item. Click on or use shortcut key Control-s to save the changes. Click on to get a printable version of the details. Click on to get a printable version of the details in PDF format. Click on to cancel ongoing changes. Click on to delete the item. Click on to refresh the display. Some buttons are not clickable when changes are ongoing. button is clickable only when changes are ongoing. When changes are ongoing, you cannot select another item or another menu item. Save or cancel ongoing changes first. This area allows to add an attachment file to the item. Drop the file in the area. Or click on the area to select a file. The fields are regrouped under a section. All sections can be folded or unfolded, clicking on the section title. The sections are organized in columns. Number of displayed columns can be defined in user parameters. When the section contains a list, the item count is displayed at right of the header. Thumbnails are displayed on item row to present field values in graphical format. In a list, possibility to go directly to an item by clicking on its fields. Cursor change to on clickable fields. Allows copied an item of the element. 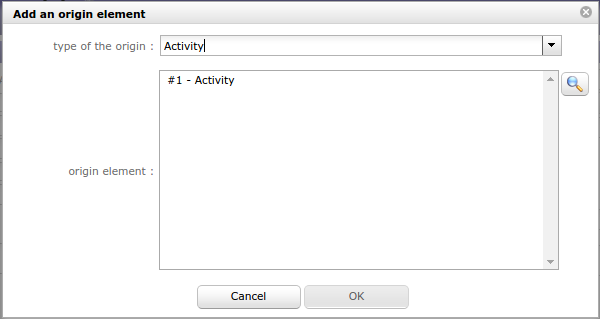 The options displayed in dialog box depends on whether the element is simple or complex. Simple element (environment parameters, lists,…) can only be copied “as is”. Complex element (Tickets, Activities, …), it is possible to copy them into a new kind of elements. 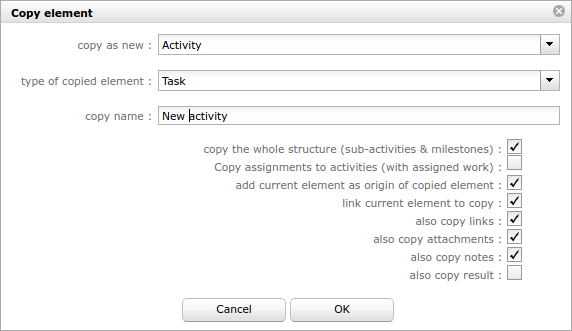 For instance, it is possible to copy a Ticket (the request) into an Activity (the task to manage the request). Select new type (corresponding to the kind of element). Select whether the initial element will be indicated as the origin of the copied one. For main items, it is also possible to choose to copy links, attachments and notes. For Projects and Activities, it is also possible to copy the hierarchic structure of activities (sub-projects, sub-activities). The new item has the status “copied”. Allows to send an informative email to defined recipients list. Flag on the role checkbox to define the recipients list. Flag on the checkbox “other” to manually enter email addresses. The message that will be included in the body of the email, in addition to a complete description of the item. Flag on to indicate the email message will be saved as a note. Allows to update several items in one operation. The fields that can be updated depends on the element. The fields are grouped by section. Click on to quit the multiple mode window. The selection of items can be done by selecting them in the list window. Or use checkboxes to select/unselect all items in the list. The count of items selected is displayed. Click on to save updates on selection. Click on to delete all selected items. The update will be applied to all the items (if possible) and a report will be displayed on the right. Allows to fill a checklist form. A checklist is available, whether a checklist form is already defined for the element or the element type. The checklist forms are defined in Checklists screen. The access to view the checklist depends on your access rights. 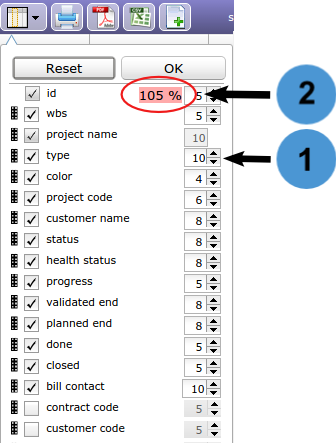 The user parameter «Display checklists» allows to define whether the checklist appears in a section or in a dialog box. If the value “On request” is set, the button appears on the detail header window. Click on to display the checklist form. With other value the “Checklist” section appears in the detail window. The user just has to check information corresponding to the situation. When done, the user name and checked date are recorded and displayed. Each line can get an extra comment, as well as globally on the checklist. All the changes items are tracked. They are stored and displayed on each item. On creation, just an insert operation is stored, not all the initial values on creation. Operation The operation on the item (insert or update). Value before The value of the field before the update. Value after The value of the field after the update. Date Date of change operation. User Name of the user who operated the change. The user parameter «Display history» allows to define whether the history of changes appears in a section or in a dialog box. Click on to display the history of changes. If the value “Yes” is set, the “Change history” section appears in the detail window. This button allows to show or hide work changes done in “Real Work Allocation”. For section «Change history» the display of work is defined in user parameter «Display history». Selection of text editor can be done in User and Global parameters screens. The most advanced web editor. Spell checker available with this text editor. Possibility to deactivate the SCAYT spell checker. It can be modified by each user in user parameters. Historically first used on ProjeQtOr. This section describes the ProjeQtOr special fields. This button allows to skip to the next status without having to open the list. The next status is defined by the workflow linked to the type of element. This button allows to set the current user in the related field. Combo list field allows to search, view or create item associated with the field. The access to view or create item depends on your access rights. Some buttons can be not available. Click on to get the list of values. Click on will directly go to the selected item. Click on to access item details. The next action depends on whether the field value is filled or not. If the field value is filled, the details of item associated are displayed. Click on to re-select an item. Click on to close the dialog box. If the field value is empty, the list of items is displayed, allowing to select an item. Click on to select items. Click on to close the window. You have access to Rapid filter, Quick search and Advanced filter. Some elements is possible to select several items, use Control or Shift. This field allows to determine the element of origin. The origin may be selected manually or automatically inserted during copying an element. Click on to add a orgin element. Click on to delete the link. Type of the orign Type of element to be selected. Origin element item to select. This field allows to set the color of an item. Used to differentiate items in list or report. Click on list of colors to select. Click on “Reset” button to erase. Thumbnails are a graphical representation of the field value. Displays the date of creation or update of the item. Move cursor over thumbnail to display the date. The Item have been created or updated today. The Item have been created or updated recently. Displays the user who created or updated the item. Move cursor over thumbnail to display the name and a large photo of the user. The user doesn’t have a photo. Indicates a comment or description is defined. Move cursor over thumbnail to display text. Indicates the visibility level defined in a note or attachment. Displays a colored circle for field colorable. Some list of values has a field to define a color. A color is defined for each value. Allows to disconnect the user. This parameter defines whether a disconnection confirmation will be displayed before. Allows to access user parameters. Allows to hide or show the menu section. This parameter defines whether the menu is hidden by default. Allows to enable or disable switched mode that allows to switch between list and detail windows. Window selected is displayed in “full screen” mode. Hidden window are replaced by a gray bar. Click on the gray bar to switch between windows. This parameter defines whether switching mode is enabled or not. 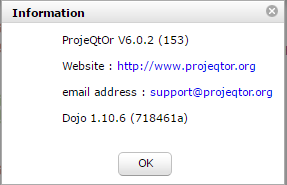 Click on button to access to ProjeQtOr site. One-click to displays in full Screen view. Internal alerts can be sent to users. An internal alert can be sent by the administrator or by monitoring indicators. The message will be received by user via message pop-up. Monitoring indicators send only warning and alert message. The indicators are defined in Indicators screen. Users may receive messages pop-up, displayed on the bottom right corner of the screen. Select to remind you in a given number of minutes (message will close and appear again in the given number of minutes). Mark it as read to definitively hide it. Mark as read all remaining alerts (the number appears on the button). On Alerts screen, the user can read the alert messages marked as read. On indicatorable items, you may see a small icon on top left of the detail of the item. Just move the mouse over the icon to display, which indicator has been raised. Just move the mouse over the red line to display, which indicator has been raised. Users can select Theme to display the interface. This parameter defines the theme to display. The new theme is automatically applied when selected. By default your selected theme is “ProjeQtOr ‘Flat Desgin’ Blue”. Screenshoots has been taken with “ProjeQtOr Standard” theme. Each user can choose the language to display all the captions. This parameter defines the language used to display captions. Control-s to save the changes. F1 to open the online user manual, to the page corresponding to the actual screen. ESC to exit full screen mode of CK Editor. The point will be replaced by a comma if the numeric format requires it.